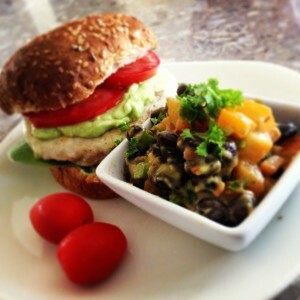 It just so happens that we grilled Chicken Burgers last night and there were a few left over; for lunch today, Luke got a Chicken Burger with Avo Dressing and Bean Salad on the side! In large bowl combine black beans, chopped pepper, chopped green onion, lime juice, salsa and buttermilk. Add salt and pepper to taste and stir well. In separate small bowl. mash large avocado. Stir in white portion of green onions, lemon juice, cumin, salt and pepper. Pour dressing over prepared Black Bean and Pepper Salad and stir well. 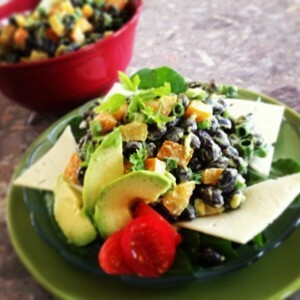 Serve on a bed of Fresh Spinach leaves or Garden Greens. 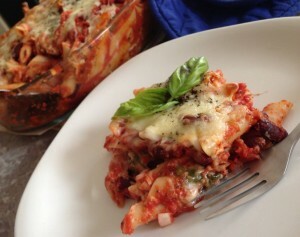 Top with a bit of shredded Monterey Jack or Cheddar Cheese. Garnish with Fresh Cilantro and Grape Tomatoes. I reserved a lil of the Avo Dressing and spread about 1 teaspoon on the bottom portion of a hamburger bun, topped it with a grilled chicken burger, dolloped on another Tablespoon of Avo Dressing, finished off with fresh spinach leaves and a few tomato slices.